Imagine a whisky-soaked motorcycle ride to Bourbonville, U.S.A. or a snowy voyage to Vodkagrad in Russia. The Jose Cuervo Express is the Mexican equivalent, but this is no mere fantasy. It sounds like an imbiber’s dream: a tequila-drenched, high-speed ride to a hangover. Could the reality live up to such hedonistic promise? As altruistic as ever in its dedication to investigative journalism, the Reporter set off to find out. Billed as the only train that actually takes passengers to Tequila, one of Mexico’s fabled pueblo magicos, the Jose Cuervo ride opened only last month. It is a rival to the Tequila Express, which for 14 years has been transporting visitors to the Herradura distillery in nearby Amatitan. 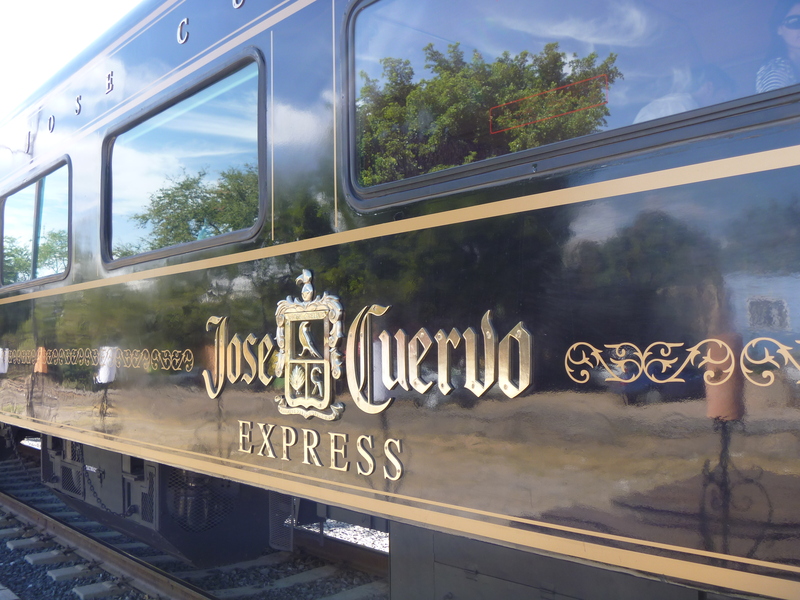 Part of its ongoing efforts to boost tourism in Tequila, Casa Cuervo purchased a locomotive and carriages from the now-defunct Maya Express, which used to circulate the ancient ruins of south-east Mexico. It is only the third passenger train now running in the country, after Herradura’s Tequila Express and the “El Chepe”train that navigates Chihuahua’s majestic Copper Canyon. The train holds up to 395 passengers, but the absence of any gringo tourists was surely a consequence of this being Super Bowl Sunday. It rumbled along at a gentle pace, passing the immigrants who live beside the railroad tracks and winding through the city outskirts into the rugged Jalisco countryside. Glancing out the windows of the finely furnished cabins revealed the Tequila Volcano and row upon row of the spiky blue agave plants that are so emblematic of the state. In few places is it considered socially acceptable to start downing spirits at 11 a.m. Thankfully, Mexico is not a country inhibited by such puritan concerns. Having attended a wedding the previous night, I had little option but to continue drinking so as to ward off any impending hangover. Purely in the name of research, I deemed it prudent to put the waiters through their paces and find out if they were up to the task. They did not disappoint. 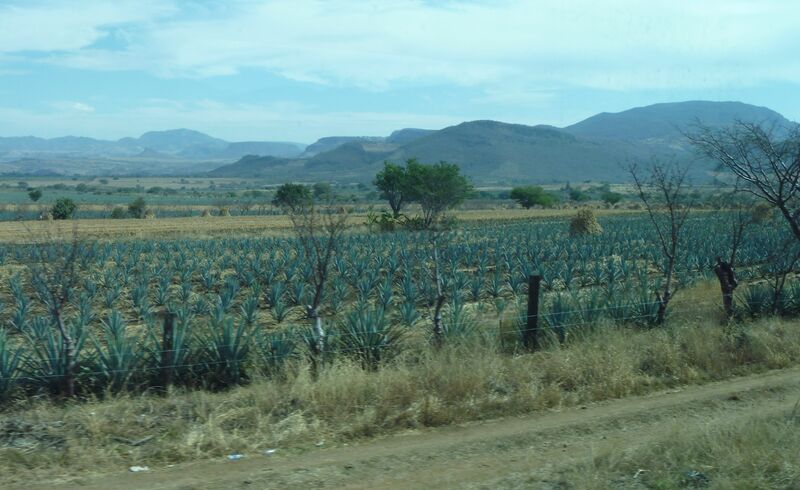 As much agave-based booze as one could handle (margaritas, shots, palomas, vampiros) was readily available throughout the entire journey and back. The complimentary cocktails slipped down all too easily, but my ambitious initial rate of one drink every 15 minutes proved unsustainable beyond the first hour and a quarter. Drinking on an empty stomach is never a good idea, so it was a welcome relief to see the ever-attentive staff on hand with delicious nibbles, including empanadas, chicken tostadas, mini tacos and tortas ahogadas. 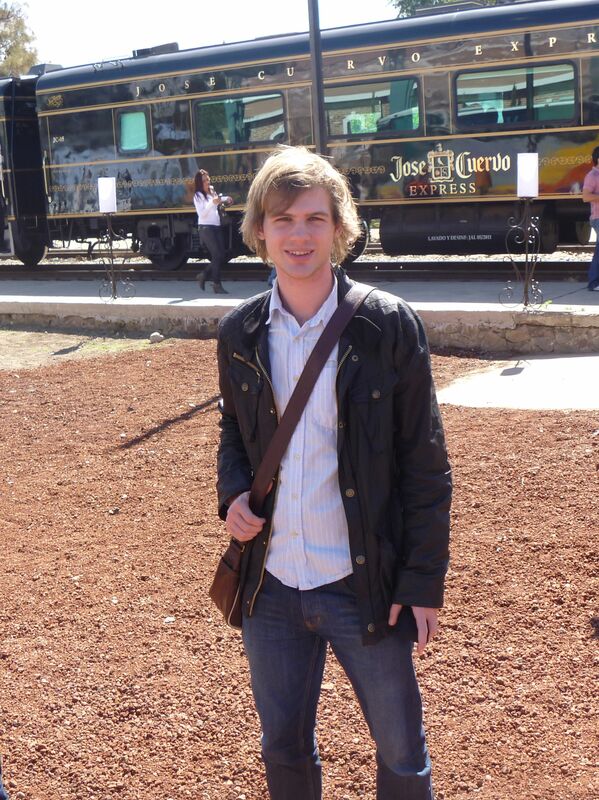 Upon arrival in Tequila, we were herded into a bus which transferred us to the Jose Cuervo factory. Home of the world’s most famous raven, La Rojeña is the oldest distillery in Latin America, having been founded in 1795. The distillation process and the history of Casa Cuervo was explained at length on the factory tour, while free samples of the various tequilas sustained the blood alcohol levels nicely. The most potent spirit on offer was a 55-percent tequila blanco, which is so strong it has to be watered down before it can be sold legally. The longer a tequila is aged in wooden barrels, the richer its flavor and the darker amber its color. The finest sample we were offered was the Reserva de la Familiar, a limited edition añejo made from hand-selected mature agaves. A bottle will set you back over 3,000 pesos, but the tequila’s smooth taste with hints of honey and vanilla left many thinking it would be worth every centavo. Following the factory tour, a round of strawberry margaritas accompanied a brief live show in the gardens of the Cuervo estate. Tribal music blasted out and smoke wafted across a small stone amphitheater where men and women danced in Aztec-style costumes to symbolize the ancient roots of Mexico’s fiery national drink. Tequila is believed to be a Nahuatl word for “The place of harvesting plants” and agave cultivation dates back hundreds of years to when pre-Columbian civilizations would brew pulque. Tequila as we now know it was born later when the Spanish introduced more advanced distilling techniques. After this colorful history lesson we were treated to mariachi music and a buffet of traditional Mexican cuisine. Another tasting session followed. 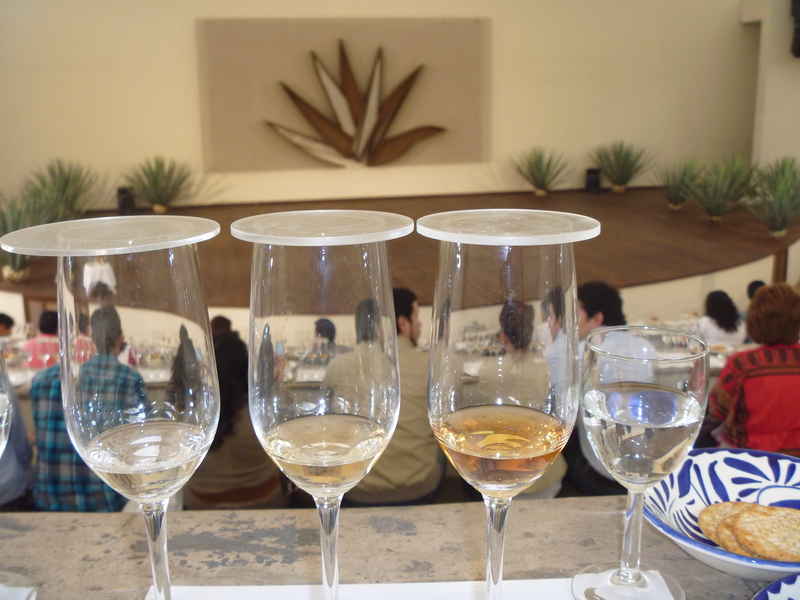 This time we were taught to appreciate the different smells and subtle flavors of tequila blanco, reposado and añejo. The recommended way to consume tequila is to hold it in the mouth for five to ten seconds instead of downing it with a smearing of salt and lime like an over-excited Spring Breaker. After all, the brewers want tequila to enjoy the reputation it deserves as a fine drink comparable to Cognac or Scotch. A final flurry of mariachi and traditional folkloric dancing marked the end of a long day and we were duly ushered back to the train. At 1,290-1,700 pesos, the Jose Cuervo Express is a little more expensive than the Tequila Express, which costs 1,200 pesos. However, it promises a more upmarket experience and is the only rail option for passengers who want to see the town of Tequila. The train leaves from Guadalajara’s Estacion Ferrocarril on Avenida Washington, next to Parque Agua Azul. Friday evening tours (1,700 pesos) leave the station at 7.30 p.m., returning early on Saturday at 2.30 a.m. On Saturdays and Sundays (1,290-1,590 pesos) the Express leaves at 11 a.m. and returns at 8 p.m. Children and senior citizens travel at discounted prices. For reservations or more information visit http://www.josecuervoexpress.com or call free on 01-800-681-0442. Tickets can also be purchased at the Tienda Jose Cuervo on Avenida Vallarta 5005 (corner with Niño Obrero) or in the Hotel Camino Real on Mariano Otero and Avenida Las Rosas.